Notre Dame women’s basketball coach Muffet McGraw wasn’t the only prominent sports figure that spoke out against gender inequality Thursday. On the same day McGraw made an impassioned plea during an interview prior to the women’s Final Four, Claressa Shields expressed her own views on the topic while she was interviewed as part of a media workout in Miami. 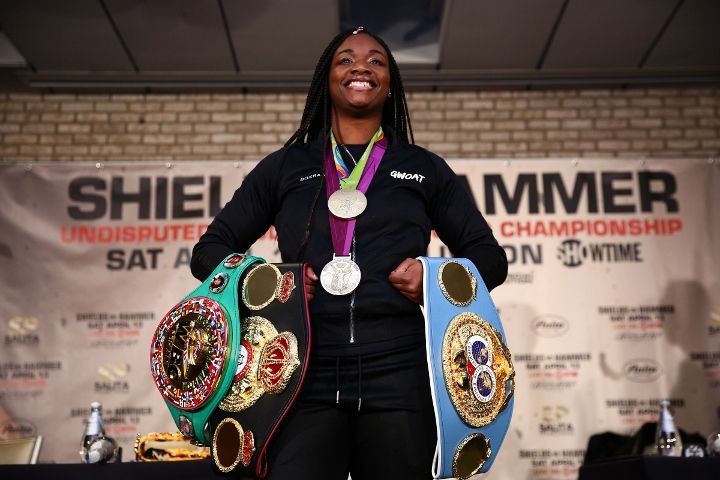 Shields, the IBF/WBC/WBO women’s middleweight champion, is finishing up training camp there for her 10-round, 160-pound title unification fight against Germany’s Christina Hammer on April 13 in Atlantic City, New Jersey. Shields-Hammer is widely viewed as the biggest women’s boxing match since Laila Ali stopped Christy Martin in August 2003. Ali, a daughter of Muhammad Ali and a super middleweight champion at that time, typically fought four weight classes above Martin, a women’s boxing pioneer who lost their bout by fourth-round knockout. Shields and Hammer, meanwhile, are much more evenly matched. The 24-year-old Shields (8-0, 2 KOs), a two-time Olympic gold medalist from Flint, Michigan, typically is listed as a 4-1 favorite to beat Hammer (24-0, 10 KOs, 1 NC). The 28-year-old Hammer has held the WBO 160-pound championship since October 2010, nearly two years before Shields won her first gold medal at the 2012 Summer Olympics in London. Showtime will broadcast the Shields-Hammer match as the main event of a “ShoBox: The New Generation” tripleheader. The premium cable network’s three-bout broadcast is set to start at 9 p.m. ET a week from Saturday from Boardwalk Hall’s Adrian Phillips Ballroom.